Below are the final exchanges from a piece on Thursday’s Today programme. Justin Webb is the Today presenter, Brian Hoskins is a scientist from Imperial College, and Nigel Lawson is the ex-Chancellor. It starts with Hoskins addressing the measurement (note that word, it will come up again) that although over the last 40 or so years we had significant global warming, the temperature rise (at the surface) looks to have slowed a bit over the last 10 to 15 years. Sir Brian Hoskins: It hasn’t risen very much over the last 10-15 years. 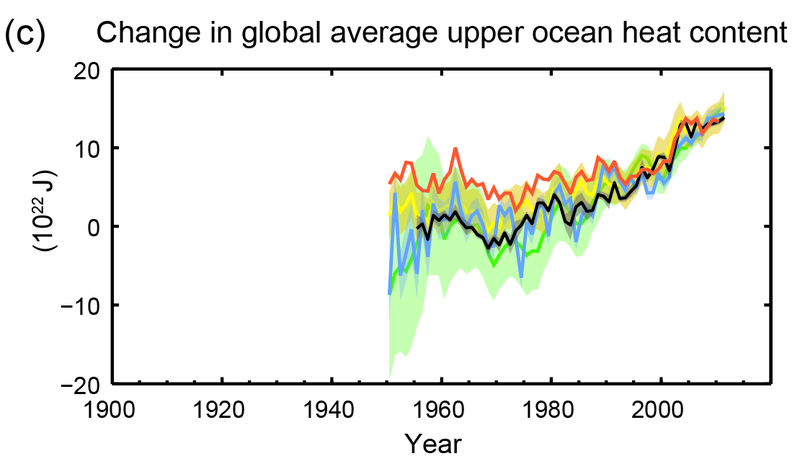 If you measure the climate from the globally averaged surface temperature, during that time the excess energy has still been absorbed by the climate system and is being absorbed by the oceans. Justin Webb: So it’s there somewhere? Justin Webb: Well, it’s a combination of the two isn’t it? As this whole discussion is…. Lord Lawson and Sir Brian Hoskins, thank you very much. A couple of depressing things about this. The first is that Lawson thinks its OK to just flat-out deny that measurements have been made of the energy stored in the world’s oceans. Ultimately, it is matter of fact whether measurements have been made of the energy input to our oceans, and they have been done – they are in the figure above from the latest IPCC report*. It is difficult to have a debate about important problems like climate change, when the BBC invites people on who think its OK to just flat-out deny facts. But what I think is even more depressing, is Webb’s response. He seems to just compromise and say well you are both half right. He does not seem interested in determining what is true. I would hope for better from a BBC journalist. * “Ocean warming dominates the increase in energy stored in the climate system, accounting for more than 90% of the energy accumulated between 1971 and 2010 (high confidence). It is virtually certain that the upper ocean (0−700 m) warmed from 1971 to 2010” Summary for Policymakers, of the Fifth Assessment Report (AR5): The Physical Science Basis.